India's fastest indigenous train, Train 18 named as Vande Bharat Express will ply between Delhi and Varanasi. Train 18 is an indigenously developed world-class train under Make in India. The 16-coach train has been built completely in India by Indian engineers in a span of 18 months at the Integral Coach Factory, Chennai. Vande Bharat Express is the energy efficiency and the first locomotive-less train in the country and will be fully air-conditioned. These trains run on electric traction like Metro trains and will start replacing the Shatabdi Express fleet from next year. The fares in these world-class trains are 40-50 per cent higher than the Shatabdi Express. The train will cover 755 km distance in eight hours with stoppages at Kanpur and Prayagraj. It would be the fastest train on the route. The new train provides a number of features to enhance passenger comfort which include inter-connected fully sealed gangways, automatic doors with retractable footsteps, onboard Wi-Fi and infotainment, GPS-based passenger information system, modular toilets with bio-vacuum systems, rotational seats which can be aligned in the direction of travel (available only in the executive class), roller blinds and diffused LED lighting and disabled-friendly toilets. Q. 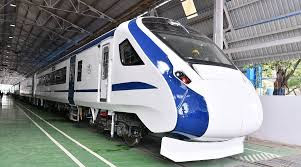 What has India's fastest indigenous train (known as Train 18 till now) been named which will ply between Delhi and Varanasi?